My food trip to the west coast of United States was overally disappointing, especially Los Angeles where i learnt why Micheli quit Los Angeles. San Francisco actually passed the test, however, very low in value compare to Tokyo. The most impressive and amazing meal i had during this trip is deinitely Saison, a three-Michelin-starred New American restaurant in San Francisco. Before making a reservation at Saison, you have to make sure your wallet can afford it, as it is the most expensive restaurant in California and the west coast, also the second most expensive across the country after Masa in NYC. The restaurant housed in a red brick house that is easily found on the main street. The interior is very simple and a bit rustic but warm and very comfort. There are two dining areas, there are about 6 tables in the main dining area which directly face the open kitchen. Guests whose reservation is after 7:30pm will be seated at the lounge area where is closer to the entrance and slight off the open kitchen (still able to see the kitchen though). Luckily we got a table almost inside the kitchen which has a wonderfull view of chefs' work. As mentioned, Saison is the second most expensive restaurant in the United States. Saison opens for dinner from Tuesday to Saturday, there is only one menu priced at $398++ is served. You suppose to pay at least $500 dollars here after tax and service charge without ordering any drinks. Wine pairing is priced at $298++ perhead. I stepped into Saison with a mood of 'once upon in my life...' so both my partner and i ordered wine pairing as well. The meal started from 6pm and lasts for more than 5 hours (because we had a drink at the bar afterall). We paid $1100 per head at last, indeed, the most expensive meal in my life by far. The meal started with a cup of warm tea with fresh herbs from Saison's garden. Then we were served the Saison reserve caviar, a dish that i had been hungry for for a long while. A glass of melted leek puree and its sauce was served to be topped with caviar. Creamy leek with a burst of ocean flavors, dreamy textures and flavors. Here we also had one of the best rolls ever - the house parker roll made with pork lard. It was pillow-soft and very buttery, perfect with leek puree and caviar! - A great beginning. Before caming to Saison, i did some research and found that a lot of dishes here have Japanese/Asian twists. The second dish for example, a simply grilled radish ('daikon' in Japanese) served with its clear soup ('dashi' in Japanese), and wine pairing is Japanese sake. The soup was simply delicious, radish was juicy and sweet. Next is 'sashimi' part - lightly grilled lobster (left) and fresh lobster tail (right) served with lettuce, wakame (seaweed) salt and lobster shell vinegar for dipping. The rarely-touched lobster was very tender and gives a sweet hint. The fresh sashimi part was clean and too delicious. I am not a trout person but this dish made me crazy. It was a combination of perfections - crackling skin, buttery and juicy meat, with fat and umami roes bursts with satisfying pops. Arguebly the most impressive trout dish i had by far. Followed by another dish that brought me to heaven - sea urchin liquid toast. The sourdough was from the famous Tatine Bakery, it was toasted on one side and soaked in a mixture of egg yolk, brown butter and soy sauce on the other side. The toast itself was creamy enough with a crispy texture and the sea urchin brought the entire bite to heavenly high. I cannot find proper words to discribe the filling so...please try by yourself if you have a chance. Continued with a small fillet of grilled black cod in a citrus and yogurt sauce. Normally brown/black sauces are served with black cod for some reason but Saison definitely make the dish in a very unique way to be remembered, and most importantly, it is delicious. The flesh was succulent, sauce was creamily light and refreshing. Few fine dining restaurants offers a lot of vegetable dishes in their menu, since Saison has its own garden, you can enjoy fresh and tasty vegetable dishes prepared in a fun way at Saison. I know most people don't like vegetables especially when they fine dines, excuse me? Then i must say Saison will change your view of vegetables in some ways. Such as this smooth and creamy celety dish and those little herbs, and...another highlight followed by. Here comes the best beetroot dish in my life. It was perfectly roasted over coals - juicy, soft, sweet and has a lovely coal aroma. The highlight part was the bone marrow sauce served by the table, it makes the beetroot full of umami flavors. I need one tones of this. Our main course of the night, was a grilled whole duck to be served in different ways. The duck dish had been on the menu for a very long while, it is now a signature of Saison. First of all, we were served a duck liver "toffee" with caramelised white chocolate, bread "lace"made of Tartine Bakery's bread, topped with beer foam. After that comes the duck breast, its barely touched pink color in the center was drooling. The duck had been aged fro three weeks and was whole grilled near the fire. My partner who had been there several times told me this is the best duck dish he had in the states. The duck breast is slightly chewy but much more on the tender side - just perfect for my liking. The topped deep-friend Sakura leaf gives its a crispy texture, its slightly bitter taste balanced well with the duck. This is to be remembered too. Homemade buttermilk ice cream infused with cirtus, served in a lovely mandrin with some fresh blood organge on the bottom. The ice cream was creamy and silky, surpringly with an Asian sweetness instead of Amercian. It left a mouthful of elegant citrus flavor. Another ice cream came to our table, this time a cooked one, served with caramel sauce and toasted buckwheat. 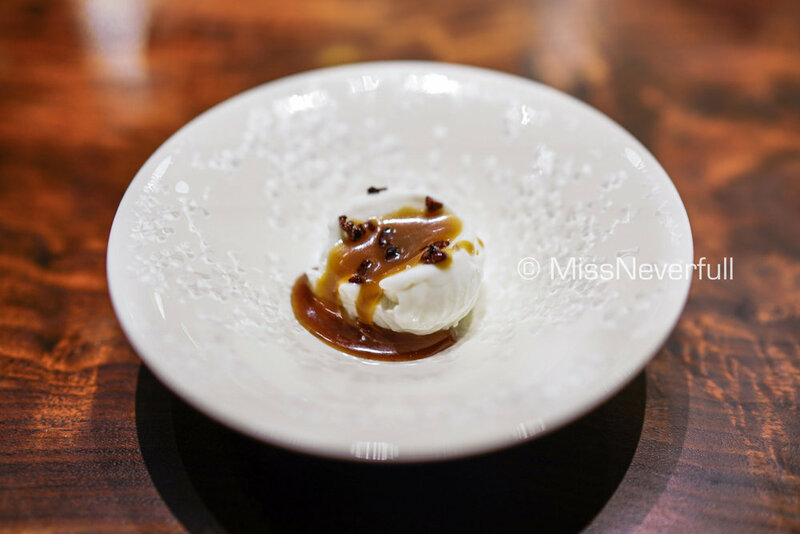 The chewy texture of the smoked ice cream was interesting , caramel sauce was also smoked, the entire bite was very enjoyable. The last part of the meal was some fresh wild strawberries and perfect poached pears. Sweet ending. After the meal, sommelier Thatcher kindly gives us a kitchen tour. 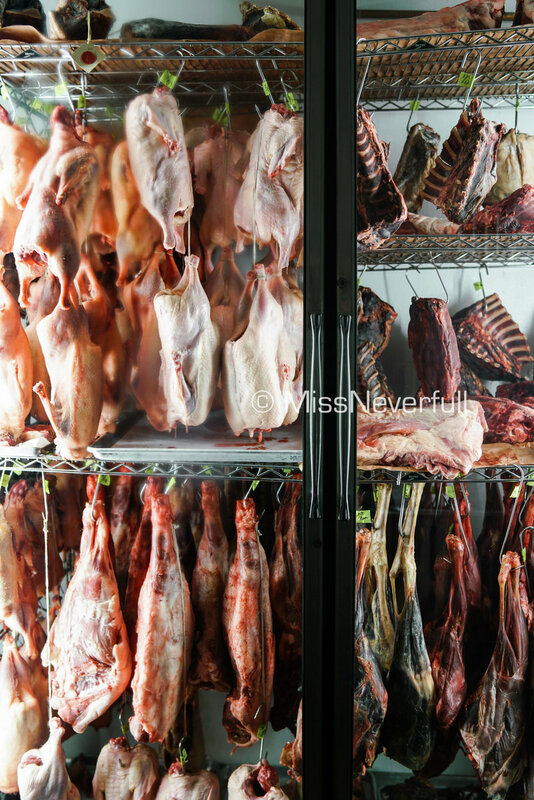 We were pretty lucky to say hi to all the aged meats and fresh fruits in prepartion for desserts in the storage on the second floor. And that's almost the end of 'once upon a time in life...', since i took a 10h+ flight from Asia to here to eat, why not try everything new even i was Miss.Full at this point? So we sat down at the bar to enjoy two recommended drinks. Both pretty lovely. My conclusion in short: i felt like purchased 10 punds of fat to my body with US $1100, but i never regret. No matter how, i am a loser. Every single dish was unique and fawless, very fresh and quality ingredients and prepared in their best. Very good wine pairing to enhance the original flavor of the dishes. All the staffs at Saison are really patient and friendly, all the dishes were served efficiently and were explained detaily. Leave aside its price tag, Saison is my favorite restaurant in the west coast.